Saurashtra's seam bowling has been an underrated virtue this season largely because of the havoc created by the Jadejas - Ravindra and Dharmendrasinh - on the raging turners of Rajkot. But their claim to early bragging rights in the semi-final was engineered by some first-rate seam bowling from the left-arm pair of Jaydev Unadkat and Hardik Rathod. 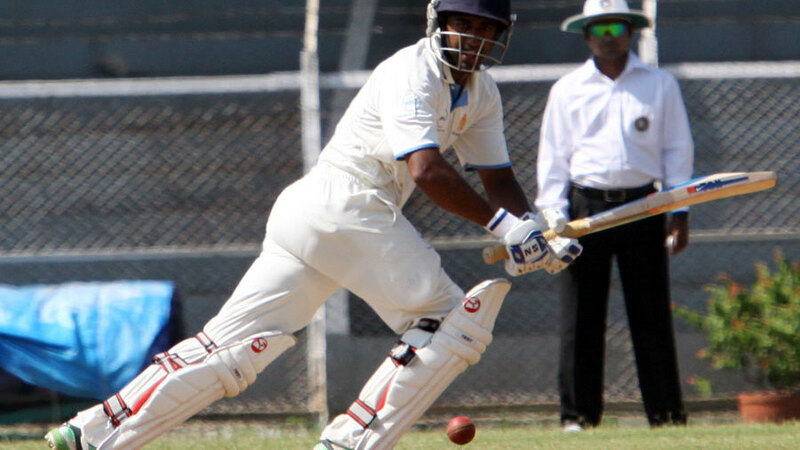 Assam, after being asked to bat, struggled with yet another batting meltdown, with only Amit Verma, unbeaten on 74 after a nagging day-long examination, and KB Arun Karthik attempting to wear the opposition down. But Arun Karthik's wicket in the 62nd over, brought about because of misjudgment in length to an indipper from Rathod, opened the floodgates; Assam lost three more wickets in the space of 11 overs, eventually ending the day on 193 for 7. While a whiff of the early-morning nip might have aided swing bowling, pronounced movement off the seam on a sturdy, grass-speckled surface was the defining aspect of Saurashtra's bowling. There was pressure applied on both ends, with a chatty slip cordon making it harder for the batsmen. Not surprisingly, Rathod landed the first blow in the fourth over as Rahul Hazarika, hassled by a succession of prickly, good-length deliveries, poked one to first slip where Cheteshwar Pujara bent forward to hold a fine, low catch. His opening partner, Pallavkumar Das, was luckier as Pujara put down a similar chance, off Unadkat. Assam's next casualty was Gokul Sharma, the captain, who was bowled by Unadkat. With Unadkat and Rathod mostly persisting with just short-to-good length, Sharma's dismissal was an exception: it was full and snaked through Sharma's feeble front-foot offering. Having received a reprieve early on, Pallavkumar couldn't encash his luck for much longer as Rathod got one to cut back into his pads and the batsman was trapped in front of the stumps. Assam coach Sanath Kumar had said on Friday that his team's wobbly batting had virtually made it non-negotiable for one of the three professionals to score heavily, and in Verma and Arun Karthik they had two willing volunteers. Having weathered the last few overs of Rathod and Unadkat's extended first spells, they found a little respite in the third and fourth seam-bowling partnership of Deepak Punia and Chirag Jani, but it wasn't much more. Punia was miserly all day, conceding only 36 runs from 21 overs. For Verma and Arun Karthik, the square cut and the flick were the go-to strokes, and once the surface calmed down a bit, they ventured to drive through cover more often. Whenever Saurashtra's bowlers went for the bouncers - they even had a leg trap complete with a leg gully and a short leg standing deeper than usual - both batsmen rode them down or left them alone. While they managed only 54 runs in the second session, they had importantly deprived Saurashtra of a wicket. They would return after tea to build on those small gains, and the intent came through in the accelerated rate of scoring. But Arun Karthik's wicket left the door ajar for Unadkat, who dismissed Syed Mohammad, the quarter-final centurion, and Swarupam Purkayastha in successive overs. Mohammad's wild slash was a response to being tied down by some sharp seam bowling, and he was duly caught behind. Verma, though, didn't flinch; the last ball of the day that had him squared up and beaten without getting him out summed up his toil.